Content by Tony Macklin. Originally published on April 24, 2018 @ tonymacklin.net. Ready Player One is a mixed bag of goodies from the confectionery of director Steven Spielberg. It has both gummy treats and hard nuts to crack. Adapted by screenwriters Zak Penn and Ernest Cline from the 2011 novel by Cline, Ready Player One should be shown in the kitchen, so Spielberg could include the kitschy sink, since he tosses in almost everything else. This is not to say that it fails. Spielberg does achieve his goal - a showy, glitzy, bombastic entertainment. But it may be an acquired taste. At 140 minutes, it's also a sprawling, scattered ordeal. Ready Player One starts with suspension of disbelief. It is set in 2045 in Columbus, Ohio. Columbus, Ohio is the hub of virtual gaming? The VR-goggled and VR-gloved populace is experiencing a digital alternative reality called OASIS, where they can find adventure and escape. It's a relief from their cruel, bleak world of actuality. James Halliday (Mark Rylance) the creator of the game that established OASIS, has died but has left a game behind for someone to solve and inherit his fortune. It has three challenges, and there are three keys to open them, which ultimately will lead to the Golden Egg that will provide the fortune. 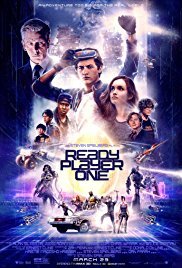 Wade Watts (Tye Sheridan) and his avatar Parzival go on the quest, as do a multitude of gamers. Joining Parzival is the avatar Art3mis (Olivia Cooke) and gangs of other gamers. Nolan Sorento (Ben Mendelsohn), a conniving corporate head, is committed to destroying their quest and seizing Halliday's creations and fortune. Sorento wields brutal power. The questers are his prey. He is villainous. Ready Player One is a dizzying treasure hunt - both for the characters and the audience. It's chockful of allusions - especially scads of references to pop culture in the 1980s. They extend from Ted and Bill to Chucky, from John Hughes to Buckaroo Bonzai, and on and on, seemingly ad infinitum. Eventually fan boys and critics will assemble maps to help guide perplexed viewers. They will attempt to lead us to fan boy heaven. But pop culture has its limitations. Some people are Ready Player Zero. In Ready Player One, pop culture and art collide. Initially it may seem a mash-up by Spielberg. Originally Spielberg was cool to Kubrick's movie. He didn't hate it as the King of pop culture did. Stephen King is a master story-teller, but a mediocre stylist. Quality style is not a priority to most pop culture. King did not appreciate what the artist Kubrick did to his work. Several reviewers sided with King and panned the film when it was released. But through time, the response has evolved, and now the movie is considered a classic. The film has transcended the novel. In Ready Player One, Spielberg seems to pay homage to Kubrick rather than disparaging his work. Spielberg and Kubrick became friends, and communicated with each other. They make an odd couple, because their sensibilities are so different. The 1970s were the Golden Age of American movies. Most of the classics of the '70s are steeped in irony. In the 1970s movies internationally were taut with alienation. But beginning with Jaws (1975) Spielberg changed movies and began to feed the blockbuster. Jaws was a sea change. Spielberg's vision is personal, but he is a commercialist; Kubrick was an ironist. Spielberg avoided irony. He promoted sentimentality. Amidst shark carnage, Matt Hooper (Richard Dreyfus) popped to the surface. Today Trump world has pretty much done away with irony, and Spielberg's soft resistance has little bite. He makes sure not to tilt the machine. In Ready Player One, Halliday says, "I am a dreamer." Spielberg basically has dreams; Kubrick had nightmares. But they both see wonderment in their visions. Spielberg sees hopeful fantasy in the nature of mankind; Kubrick saw the banal nature of mankind. Spielberg and Kubrick bonded with a project that eventually became Spielberg's movie A.I. (2001). Since the 1970s Kubrick was trying to put together a film made from a story by Brian Aldiss. In 1995 he passed the project on to Spielberg. Kubrick died in 1999, and Spielberg's film was released in 2001. After the end credits, on screen Spielberg dedicated the film, "For Stanley Kubrick." In style and attitude the directors differ drastically. Spielberg plays a hell of a game of checkers - with triple jumps. The screenplay of Ready Player One is shaky. It has some hoary lines: "Reality is real." They like the sentiment so much they repeat it, "Reality is the only thing that's real." But Spielberg plays a better game than his writers. At the end of Ready Player One, Spielberg seems to borrow from the vision of War Games (1983). It's about playing the game that is the crux. But, if Stanley Kubrick were still around, in the words of a machine, he might say to Steven, "How about a nice game of chess?"